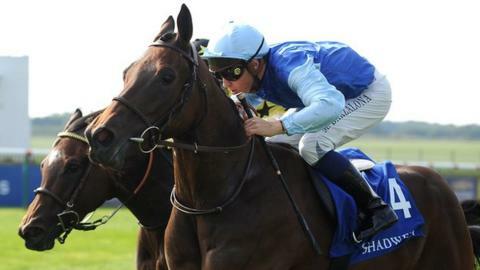 Miss France gave veteran French trainer Andre Fabre a first victory in the 1,000 Guineas at Newmarket on Sunday. The fillies' Classic attracted a number of top-class horses, with 7-1 shot Miss France, ridden by Maxime Guyon, holding off Lightning Thunder (14-1). Fabre, completing a full house of British Classic successes, said: "This means a lot. It wasn't the way I wanted her ridden, but it worked." The Saeed bin Suroor-trained Ihtimal came in third. Richard Hannon's 100-1 shot Manderley made the early running and was still in front with a furlong to go before finishing fourth. Guyon kicked on before the dip, winning by a neck fromOlly Stevens' Lightning Thunder - who she also beat in the Oh So Sharp Stakes at Newmarket in September. Stevens said: "We're thrilled. This is childhood dream stuff, to be here with a horse of this quality." Clive Brittain's hotly-tipped Rizeena was not totally disgraced, coming home just behind the leaders. Miss France's triumph followed a disappointing sixth on her return to action in last month's Prix Imprudence at Maisons-Laffitte. She was briefly removed from the 1,000 Guineas betting by some bookmakers but Fabre insisted he always had faith in the three-year-old. "There was a question mark after her first run this year but I knew that race wasn't to be believed," added the 68-year-old. Fabre has been France's champion trainer 25 times and had previously won three of the other four British classics. He triumphed in the Oaks with Intrepidity in 1993, in the 2,000 Guineas with Zafonic in the same year and also in 1995 with Pennekamp, and won the St Leger with Toulon in 1991.